We’d love your help. Let us know what’s wrong with this preview of The Brideshead Generation by Humphrey Carpenter. To ask other readers questions about The Brideshead Generation, please sign up. I feel a bit mean only giving this 3 stars, because parts of this book are outstanding and worthy of 5 stars, but parts of it really let it down. The opening sections, in which Carpenter paints a wide-ranging and vivid picture of the Oxford context in which Waugh was educated and illustrates the aristocratic milieu to which Waugh always yearned (never entirely successfully) to belong, cannot be faulted. Meticulous use of multiple sources, including first-hand testimony from those who were there ( I feel a bit mean only giving this 3 stars, because parts of this book are outstanding and worthy of 5 stars, but parts of it really let it down. The opening sections, in which Carpenter paints a wide-ranging and vivid picture of the Oxford context in which Waugh was educated and illustrates the aristocratic milieu to which Waugh always yearned (never entirely successfully) to belong, cannot be faulted. Meticulous use of multiple sources, including first-hand testimony from those who were there (principally Harold Acton), enables Carpenter to create so authentic a sense of the decadent Twenties that I almost felt like I was there, too. He also handles Waugh's life immediately after leaving Oxford well, telling his story in parallel with many of his contemporaries. It is when the focus of the book narrows almost exclusively to Waugh (possibly the point at which Acton lost touch with him, rendering Carpenter's most lively source redundant? Just a hunch - I have no idea), with occasional discussion of Greene, Connolly and Betjeman, and Carpenter falls back on a heavy-handed, amateur psychologist reading of Waugh's novels that the book starts to flounder. Carpenter's repetitive attempts to read the influence of "Alice In Wonderland" and/or Waugh's sibling rivalry with Alec into absolutely bloody everything quickly become wearisome and read like a C grade piece of 'A' level English coursework. His simplistic reduction of "Brideshead Revisited" to a roman a clef, where he plays spot-the-real-life-figure-behind-the-character, is particularly painful, especially when he has to acknowledge that some characters are, in respects, not at all like the real-life figure he has assigned to them and has to resort to some highly dubious arguments to force them into the mould. Waugh undoubtedly did draw on his own biography in his novels, but anyone choosing to read this book will almost certainly have previously read Waugh's novels and will be amply well placed to draw their own conclusions about the extent to which Waugh's characters have been borrowed form his life - carpenter doesn't have to do it for us and thrust his own half-baked theories down our throats as if they were fact. Other painful moments include the points where he suggests that Powell's "A Dance To The Music Of Time" must have been influenced by "Brideshead Revisited" because they both have first-person narrators (! ), where he uses the fact that characters are known as "Uncle" to argue that they must actually represent blood relations and his forced reading of Basil Seal's accident with explosions as emblematic of the effect of Waugh's own "explosive" behaviour. That said, the section on Waugh's Gilbert Pinfold episode is chilling and sad and did something to stop me abandoning the book before the finish. Loved it! Waugh on novelistic structure: "A better word, except that it would always involve explanation, would be 'architectural.' I believe that what makes a writer, as distinct from a clever and cultured man who can write, is an added energy and breadth of vision which enables him to conceive and complete a structure." 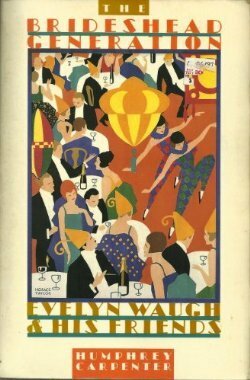 The book also made me see "Brideshead" in its true light: Charles Ryder as the villain, Catholicism as the hero.